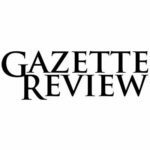 Michael and Babz Ba rnett are a married couple from Virginia who spend the better half of their time coming up with new invention ideas together. This entrepreneurial couple take pride in their ability to come up with creative and innovative ideas for potential product pitches. They took especial pride within their idea for Romp N Roll. The Romp N Roll play area is designed for children from ages anywhere between 3 months old to 6 years old. The couple carefully designed play center in order to fully invoke the cognitive workings of a child’s mind as well as to allow them to simply have a good time. While a child is at play within the Romp N Roll, they will encounter a series of activities that promote physical movement while also incorporating musical and artistic components to promote a new way of learning. Ultimately the goal with this play area is to provide children with a fun way to tap into their learning abilities. 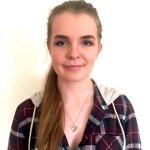 Both Michael and Babz have absolute faith in their business and want nothing more than to give kids an opportunity a creative outlet to express themselves while also learning at the same time. What they want to aim to do is to expand Romp NRoll and turn it into a business franchise. However, the couple has no way of achieving that goal on their own. Heading to ABC’s Shark Tank, Michael and Babz hope to persuade one of the Sharks to invest into their business in order to help them in their expansion plans. Michael and Babz enter the Shark Tank seeking $300,000 for a meager 10% of their company. After giving the Sharks their listing price, the couple begins to explain what exactly their company is. 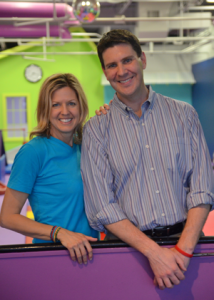 What they have created is a learning space where children can have music, art, and gym classes all in the same place. 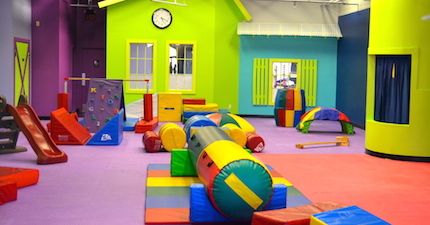 The interior of the Romp N Roll buildings are all brightly colored and kid friendly, giving off a very bright and whimsical sort of appearance. “Nurture the genius, unleash the goofball” is the business’s tagl ine, which pretty much sums up the entire goal of their operation. 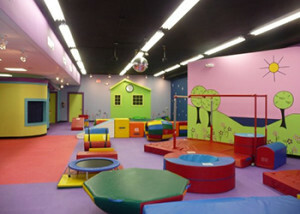 Romp N Roll offers classes for children of a variety of different ages and each class is different than the one before. Robert Herjavec says offhandedly that “I’m so excited I want to go”, which brings Babz to mention that parents are invited to stay and take part in the classes with their child. Kevin Harrington asks what makes them different from a Gymboree, to which Babz offers him an analogy, stating that Gymboree is the cassette player while Romp N Roll is the MP3 player. Currently the Romp N Roll company has 10 different locations in addition to two corporate stores. Since the beginning of their business endeavor, they have also started to franchise the business and have since then opened 8 different franchise locations. During the previous year they managed to make $1.2 million in revenue and earned a 30% in profits off of that. Kevin O’Leary asks them what it costs to reach out to their customers because not many people have heard of them before. According to Babz, they appeal mostly to mothers because the “mommy marketing” because that is more effective than any form of other advertisement. Herjavec inquires on what percentage of their revenue goes to marketing, which he finds out to be only 1%. This surprises him because he reasons that if they want to expand outside of their Virginia base, that percentage would have to substantially increase. O’Leary can hardly understand it, stating that he has never seen a business that wants to franchise only put 1% of its sales into the marketing aspect of it. Michael tries to offer a counter argument, saying that they are failing to see the influence this company would have on parents, but O’Leary begs to differ. He sold a reading software to parents that ended up becoming worth $1 billion. After some arguing back and forth, O’Leary decides not to invest into Romp N Roll despite seeing some potential within it. He doesn’t believe that the business model is thought out enough yet. Daymond John, on the other hand, simply decides that this is not a business venture his particular set of skills could cater to and does not invest. After him, Harrington doesn’t invest based off the grounds that he does not believe that they would be able to become a nation-wide franchise at a quick rate. That leaves Barbara Corcoran and Robert Herjavec. Corcoran admits that she has a 3 year old daughter who she used to take to Gymboree classes, but she recently had to stop because the one near her closed down. That particular failure has made her wary and ultimately makes her decision to not invest into Romp N Roll. Herjavec then takes his turn to speak up, asking Babz why they don’t just do a daycare, but her husband suddenly interrupts. 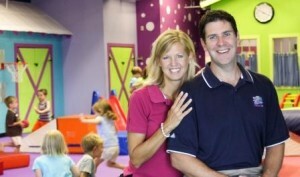 He speaks to Corcoran, insisting that she not compare her experience at Gymboree to Romp N Roll. She argues that they never made a concise display of the differences between the two companies. Michael then explains that they do 12 weeks of classes and then move onto gym, art, and music classes. In addition, each week is a different theme and the equipment in the class changes as well. Finally Herjavec gets his chance to speak and points out that four of the five Sharks are out and he is the last one standi ng. In spite of this though, they keep directing their attention towards the Sharks who have already made their decision not to invest. They apologize by saying they “have so much passion for our business that we can’t stand to have somebody tell us no”. He can understand that, but Herjavec is now wary of giving them an offer because he isn’t so sure that they can focus on one endeavor at a time. The couple insists that they put a lot of time and all their money into the business and are very serious about it, which gives Herjavec incentive enough to give them his offer of $300k for 51% of the business. ything the Sharks had to say and how they would never give up 51% of Romp N Roll. After speaking, they decide to go back in and offer 20%. However, while they are away, O’Leary speaks to Herjavec, saying that he will go in 50-50 for control of the company because he’s going to “need more money anyway”. He agrees and, before the Barnetts have the chance to speak, puts the new deal on the table. Babz argues that they don’t fully understand the business, which O’Leary quickly shuts down by saying they don’t know anyone who has ever sold a children’s educational business before. Despite taking that in mind, they still don’t agree that they should give up 51% and instead put up a counter offer of 20% for $300k. Herjavec states that he sees no way that he could ever make his money back on that and sees too much risk in that offer. He refuses to change his original offer and the couple decide to stand on their decision of refusing it. O’Leary tells them of his frustration, saying that they both missed a good opportunity, but he is also still out. With all final decisions made, Michael and Babz leave the Shark Tank with no extra money in their pockets. s across The United States, China, and South Korea. 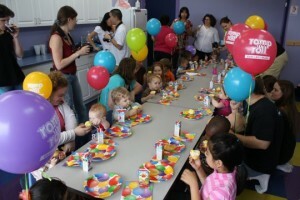 On their website (http://www.rompnroll.com/), potential customers can buy gift cards, book classes, and even birthday parties. On their website they list their various different locations and show the different types of programs that are offered for children. They even have summer camps for children who want to continue their learning over school break. All in all, Romp N Roll still managed to make a huge success despite being turned down by all of the Sharks on Shark Tank. Weirdly contentious exchange between these operators and the Sharks on that episode. Not surprised at all that no deal was made. Robert was right, he was the only one still in yet the R&R people were totally ignoring him. At that point I would’ve told them to screw off if I were him.